The Bursera graveolens (botanical name) is a typical tree of the South American Pacific coast, closely related to incense as it belongs to the same botanical family (Burseraceae). 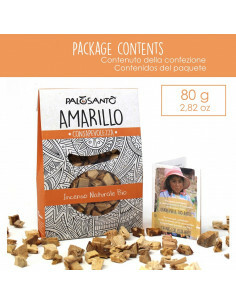 Herborea srl sells its products under the brand Palo Santo®; this brand ensures the best product, quality of work and respect for the environment. Its wood is characterised by a strong natural fragrance and has been used since ancient times by indigenous people for its many psycho-physical beneficial properties and as a spiritual remedy to purify the air from bad energy and annoying insects. Palo Santo® marketed by Herborea srl comes exclusively from these areas, therefore the quality is guaranteed and controlled. The Palo Santo® wood grains are ideal for fumigation with charcoal. They purify and perfume the space, keep away insects, create a ritual atmosphere suitable for meditation. 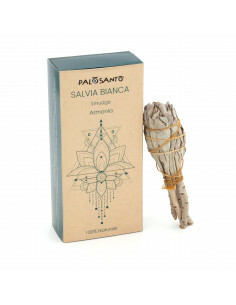 The Palo Santo® brand is a guarantee of quality and respect for the environment. The Bursera graveolens wood that we use is collected and distributed exclusively by the local population, harvested after at least four years from the natural fall of the tree, during which mushrooms and soil mucilage form the resin with its characteristic and intense fragrance.